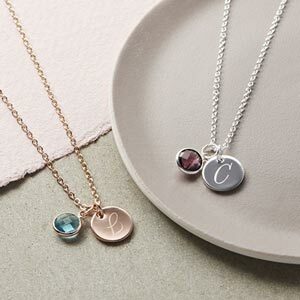 The combination of a Personalised Initial Necklace and Swarovski birthstone is a firm favourite allowing you maximum custimation for an extra special gift. A classic necklace full of sentiment. 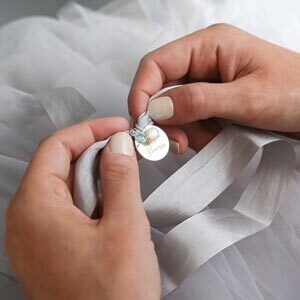 A delicate trace chain holds a 12mm disc pendant that can be engraved with two characters on the front and two characters on the back as well as a selection of symbols. This makes it ideal for your children's or your partners initials, or both. The dainty disc pendant is paired with a Swarovski Crystal Birthstone charm that not only adds colour and sparkle but also meaning with all twelve birthstones having unique properties. Looks lovely, I ordered the sterling silver option with rise gold bonding. Really nice to have a true birthstone colour and be able to chose the colour of gold, quite unique. It is a gift my daughter will love. Amazing!! Well made and stunning! These necklaces are absolutely beautiful and I cannot wait to give them to my bridesmaids as thank you gifts for helping me with my wedding!!!! The necklace is beautiful. Love the packaging. What you see is what youll get these necklaces. Lovely necklace and good price! Beautiful, high-quality necklace in a lovely presentation box. The perfect gift. Lovely necklace, lovely packaging all round worth the money! Lovely product, beautiful and can be personalised. 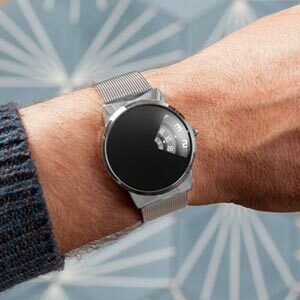 Lovely as a gift or a treat for yourself. Poor quality of both chain and birthstone all is plastic and cheap looking Thank you for your feedback, sorry to hear you are unhappy with your order. Please contact customer services on enquiries@bloom-boutique.co.uk who will rectify the issue for you today. Beautifully presented and engraved. I give it four stars because the disc with the engraved initial was a little smaller than I thought it would be.